When the Crawley Town academy folded at the end of the 2013/14 season, the then Peterborough United youth team boss called his opposite number at Crawley and asked for his best two players who he then signed on trial. The boss was Dave Robertson and one of the players was Harry Anderson. The duo have since stepped it up to the senior team in their respective roles, but Robertson thought it was worth reminding the 18-year-old where he had come from before letting him loose in this League Cup first-round tie. He wanted Anderson to show his former club what they were missing. 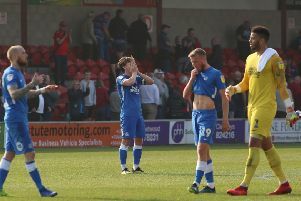 And by the end of 90 minutes, with victory sealed and the home crowd chanting Anderson’s name as they waited for the final whistle to be blown, Crawley would have realised exactly what sort of talent they had lost. It took Anderson just 80 seconds to make his mark, taking a cross-field pass from Joe Gormley before beating his man and crossing low to Conor Washington who scored at the near post. But that was just a prelude of what was to come. Less than five minutes into the second-half Anderson was on the charge. Twice he shrugged off challenges, the second a cynical sliding tackle from Luke Rooney, as he surged down the right before pulling the ball back to Marcus Maddison who took a touch and from the edge of the area hit it low to the right of Freddie Woodman. It was a rare moment of quality and determination which energised a crowd of 2,500 (minus 55 from Crawley) who had so far treated the match like it was a pre-season friendly. Not that they could have been blamed for such a low-key atmosphere. After 45 minutes at the ABAX Stadium all inside could have been forgiven for wishing they had watched the European Super Cup instead. The home fans must have been wondering where was this exciting, flamboyant team the management had promised. Instead, it was hard to escape the feeling that this was a continuation of the dull, uninspiring football from last season which led to lowering attendances and gripes from supporters. Sliding tackles brought the only ripple of applause from a crowd who must have just been pleased that Posh had the lead. Although if Matt Harrold’s back-post header had deflected more kindly off the post instead of ending up at Alex Davey’s feet to clear, then the visitors would have had a deserved leveller before the break. But that was as good as it got for League Two Crawley as they suffered at the hands of Anderson. Soon after setting up the second goal he delivered a cross from the right which Kgosi Ntlhe, who won several headers during the match, nodded back across goal only for Gormley to put his header wide from six yards. This was during a 15 minute spell where Posh should have put the match firmly to bed. A clearance over the top of the Crawley defence saw Gormley speed past Joe McNerney who appeared to get his foot to the ball, only to divert it onto the post, although it was not clear whose boot it actually came off. Ntlhe also had a good chance to score as Woodman spilled Maddison’s long-range free-kick, but the left-back could only put the rebound wide from close range. The match soon calmed down and Crawley found a foothold once again, with McNerney hitting the side netting. Robertson, who had made two changes to his starting line-up by bringing in Anderson and Jack Collison for Jon Taylor and Jermaine Anderson, gave Kyle Vassell and Souleymane Coulibaly a run-out for the last 15 minutes. Coulibaly made an impact when he was fouled by last man Sonny Bradley, although the defender was let-off with a booking. But in the end it did not matter. The match slowly wound down without drama and the home fans were content to sing their appreciation for young Anderson who was the obvious choice to be named man of the match. For Posh, they must wish they could play Crawley more often after twice putting four goals past them last season. For Robertson, it was a welcome win after a disappointing 2-0 defeat at Rochdale on the opening day of the season. And for Crawley, it was the day when they were made to rue the one that got away. Crawley Town: Freddie Woodman, Liam Donnelly, Joe McNerny, Sonny Bradley, Bryan Van Den Bogaert, Jimmy Smith, Luke Rooney, Roarie Deacon (sub Lee Barnard, 58), Lewis Young, Shamir Fennelon (sub Gwion Edwards, 62), Matt Harrold. Substitutes not used: Callum Preston, Jon Ashton, Bobson Bawling.